Mark: As a Star Wars fan, the 2015 release of Star Wars: The Force Awakens was exciting for a lot of reasons, but, in hindsight, perhaps the best thing to come out of the buzz surrounding the franchise’s cultural relaunch was the reemergence of Carrie Fisher into the public consciousness. Look, Mark Hamill seems delightful, and Harrison Ford’s turn into Curmudgeon With a Heart of Gold has become more tolerable with time, but Fisher was uniquely witty and genuine. Even if you’ve seen it before, please take a moment to watch her December 2015 interview on Good Morning America. Has there been a more perfect promotional tour interview? Fisher’s ability to simultaneously fulfill her corporate mandate and lampoon the absurdity of the situation while also being charming and warm illustrates just how much of a pro she was. She’s effortlessly charming in a way that immediately puts the lie to the transparently vacuum-sealed “Stars — They’re Just Like Us!” celebrities usually foisted upon viewers in the overenunciating hours of daytime television. I don’t know how Fisher viewed her return to the role of Leia Organa, but I hope she was pleased. And if her likeness is going to be the property of the Walt Disney Company in perpetuity, than I’m glad she was able to portray General Organa in her later years, and that both versions of the character can continue to exist in the Star Wars comics going forward. As a featured star in a mega-franchise, how strange it must be to see yourself rendered in countless mediums, and frozen in a very specific time of your life. Princess Leia features prominently in Star Wars 38, and artist Salvador Larocca’s working process means she’s rendered in near photo realism. I’m not exactly sure what Larroca’s exact methods are — whether he’s tracing over film stills and other reference photos, or manipulating the photos directly into his art — but whatever the method, it’s a choice with severe limitations. 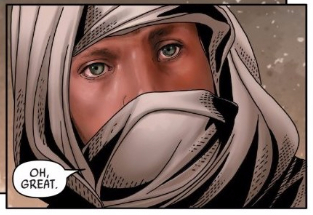 Because Larocca is mostly relying on images from the original Star Wars trilogy when rendering Leia, Luke, and Han’s faces, he has to do his best to find moments in the films where the characters are matching the emotional tenor of Keiron Gillen’s script for the issue. That’s less of a problem when characters are standing around in a room sharing conversation, but more of a constraint during sequences of intense action. The result is that panels featuring Leia, Luke, or Han are either necessarily static— there’s a lot of standing in one place, talking — or great lengths are taken to obscure the characters’ faces when there isn’t an appropriate likeness that can be lifted from the films. Too much of the issue is spent gazing at the backs of heads while dialogue boxes emanate from presumably open mouths. The opening pages of the issue hide these limitations best. On the crumbling surface of Jedha, Leia and Luke ride impossibly long-legged mounts to rescue some of Saw Gerrera’s freedom fighters. The entirety of the Rebel’s race through the sandstorm, pursued by Imperial troops, is Larocca at his best. There’s something truly beautiful about the way Larocca draws these beasts, often rendered as elegant, lithe shadows, and it’s illustrative of the imagination he shows when not handcuffed to photorealistic fidelity. I just wish there was more of this inventiveness. What’d you think, Spencer? Am I being too harsh on the issue’s art? I purposefully sidestepped discussing the plot in great detail because I’m finding kyber crystals to be impossibly boring, and their existence paired with Commander Kanchar and Queen Trios’ mining expertise too reminiscent of The Phantom Menace’s worst elements. Star Wars 38 is the start of a new arc, so there’s bound to be a certain amount of placesetting, and I’m wondering if you found more of interest in the realpolitik-ness of it all. Spencer: Mark, we’re exactly on the same page when it comes to this issue’s art. It’s a shame, because Larroca is generally a pretty phenomenal artist, and together with colorist Guru e-FX turns in some stunning images this month, but the photorealism effect he’s integrating into his character’s faces just isn’t working. Mark does a great job of pointing out their limitations when it comes to storytelling, but I honestly just don’t like them on a purely aesthetic level either. Some of the faces — such as Queen Trios’ near the issue’s end — at least manage to look like a beautiful painting (although they still feel jarring as part of a visual narrative), but others, like the panel above, feel like a bad photoshop, or some sort of bizarre cartoon Adult Swim would air at 2:15AM. It doesn’t make for a cohesive artistic experience, and other than reminding readers that the comic is based off of live actions movies, I’m not sure what it’s supposed to add to the book. 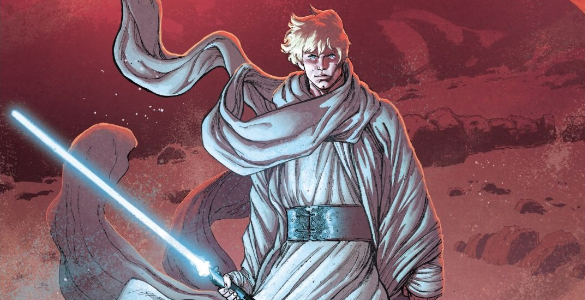 Can’t we please just embrace the fact that the Star Wars comics are, well, comics? It’s especially frustrating because Larroca’s faces in his previous Star Wars title — Darth Vader, which was also his previous collaboration with this issue’s writer, Kieron Gillen — were so impressive. Larroca managed to convey so much meaning through Vader’s face despite it being an inexpressive, unmoving mask. Whatever sort of technique Larroca’s using in this issue doesn’t hold a candle to it. As Mark alluded to, using these faces also seems to throw a wrench into Larroca’s storytelling elsewhere. Look at the following panels, a moment that left me absolutely dumfounded upon my first read and, honestly, still does even now. If you were walking into this review blind, you’d think that Larroca and Gillen were trying to keep the Queen’s face obscured for some big reveal, right? The thing is, Trios already made her grand entrance on the previous page, making this panel all the more baffling. Why cover up a quarter of a panel? Why obscure something as critical as a character’s face with another panel? Would it really have been that difficult to throw in one more photo-realistic face? I’m quite honestly baffled. I’m not exactly an expert on panel composition, but this has got to breaking a few primary rules. Storywise, I’m not as bored as Mark, but I’m not exactly engrossed either. It is a lot of set-up, but I like the ideas Gillen seems to be gearing up for. A three-or-four way conflict on a dying planet, if nothing else, will give Larroca plenty of opportunities to bring to life stunning landscapes, natural disasters, and military clashes, all of which are the most interesting and memorable moments of this issue. The fractures on both sides of this conflict — the animosity between Leia’s Rebels and Saw’s and the tension between Kanchar and Trios on the Empire’s side — should provide plenty of tension, and complicate what could otherwise have been a rather simple confrontation. Mark’s “boring” kyber crystals are just an excuse to bring the Empire back to Jedha — it seems likely that it will be both the physical and the philosophical clashes between these various factions that drives this arc, and there’s a lot of potential in that premise. In the meantime, though, yeah, putting all the pieces into place doesn’t always make for the most exciting issue. Gillen doesn’t get a lot of opportunities to dole out his typical witty, dense dialogue, nor to dive too deep into the primary Star Wars cast. 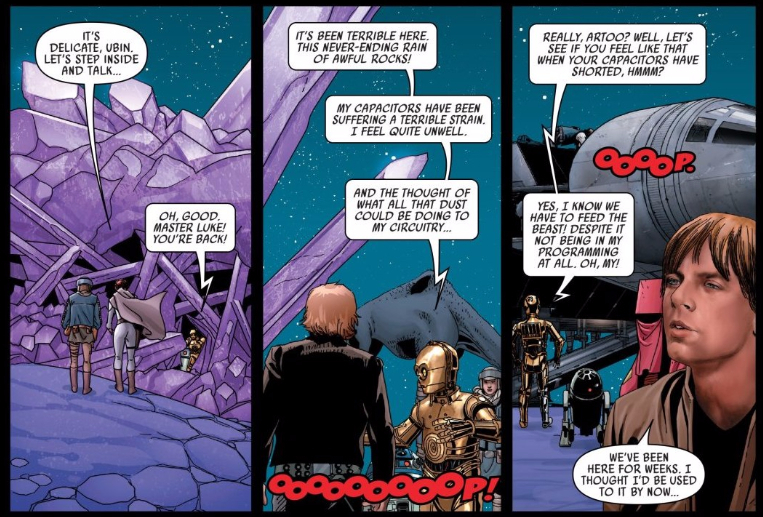 Thankfully, we’ve got C-3P0 to provide a much-needed moment of levity. 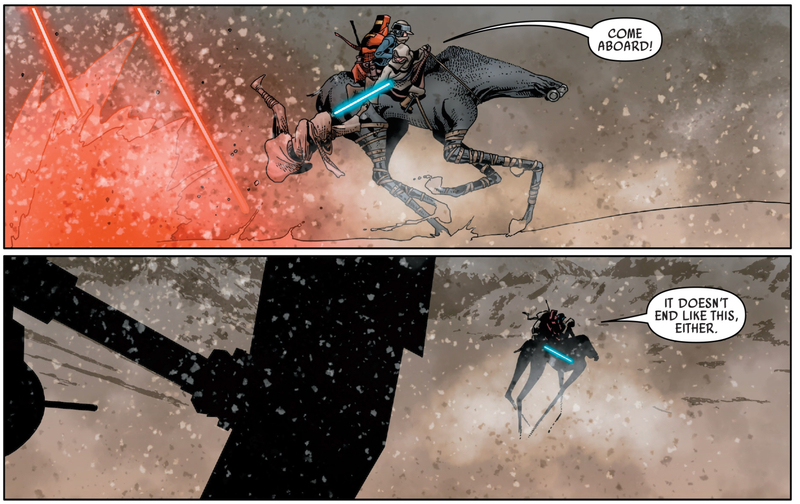 Yeah, this is more of what I was hoping for when I heard Gillen was taking over Star Wars. I imagine his story will pick up soon — Gillen’s too good for it not to — but I hope the art doesn’t continue to drag the title down in the meantime. I’m not sure whether the idea to do faces like this was Larroca’s, Marvel’s, or Disney’s, but it’s not doing Star Wars any favors.